As soon as September rolls around, all things pumpkin are fair game in my house. Pumpkin cookies, pumpkin bread, pumpkin candles, pumpkin decor, pumpkin soap, pumpkin body wash and so much more. I'm one of those crazies. One who looks forward to fall every year. One who has her fall clothes lined up even though it's still hitting 90 degrees each day. I long for fall. Fall makes me happy. To celebrate the start of the season, I did some baking last weekend. First up was pumpkin bread. 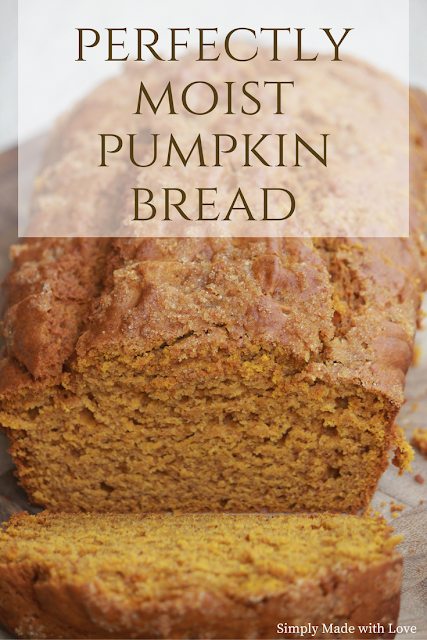 Even though I've made many different kinds of pumpkin bread before, I decided to stick to an original recipe. One with nothing added in, just moist pumpkin bread. It was the right way to kick off fall. I enjoyed the bread in the afternoon with my coffee on the weekend and every morning for breakfast. This is one of those recipes that you have to make every year. One your neighbors will be asking for time and time again. Enjoy! 1. Preheat oven to 350ºF and grease a loaf pan. 2. In a large bowl, mix together pumpkin, sugars, eggs, oil and vanilla. Set aside. 3. In a separate bowl, mix together the flour, baking soda, baking powder and spices. Set aside. 4. Add the wet ingredients into the dry ingredients, mixing as you go. Do this until both the wet and dry mixture are combined. 5. Pour mixture into the loaf pan. 6. Bake for 45-55 minutes or until toothpick comes out clean. 7. Cool before removing from the pan onto a baking rack. I’m all about quick and easy breakfast options in the morning. In the past, I would grab some sort of protein bar. But, after really looking into the ingredients in many of them, the sugar was really high. So, I started looking for a better for me breakfast option. Egg muffins were first on my list to try. Not only was I amazed with how easy they were, they were delicious. 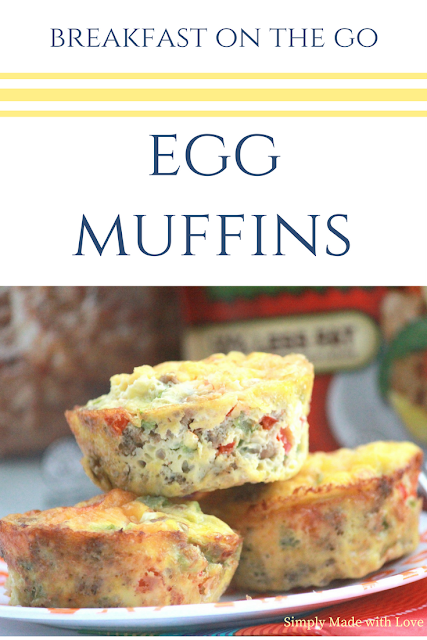 Full of flavor, filling and just as good leftover as the day I made them.It's been about a month since school has started and every morning I've had an egg muffin for breakfast. Sometimes at home on the table with a hot cup of coffee, others in the car on the way to work after a hectic morning. Preheat oven to 350 degrees and grease a muffin pan with non-stick cooking spray. In a large bowl, beat eggs and season with salt and pepper. Add diced peppers, turkey sausage and cheese to eggs and stir until all ingredients are mixed together. Fill each muffin tin about 2/3 full of the egg mixture. Bake for about 25 minutes or until the edges are brown and the center is cooked through. If I had to ask my family what they'd like for a side with dinner, the response would most likely be sweet potatoes. I make them quite often and am always trying different recipes to change things up a bit. My favorite way to eat them is cut into cubes and roaster. Hubs would probably say as a cooked potato with cinnamon and butter. The kids are indifferent as long as it tastes good to them. Since I'm the one usually cooking, roasted in the way they're usually served. 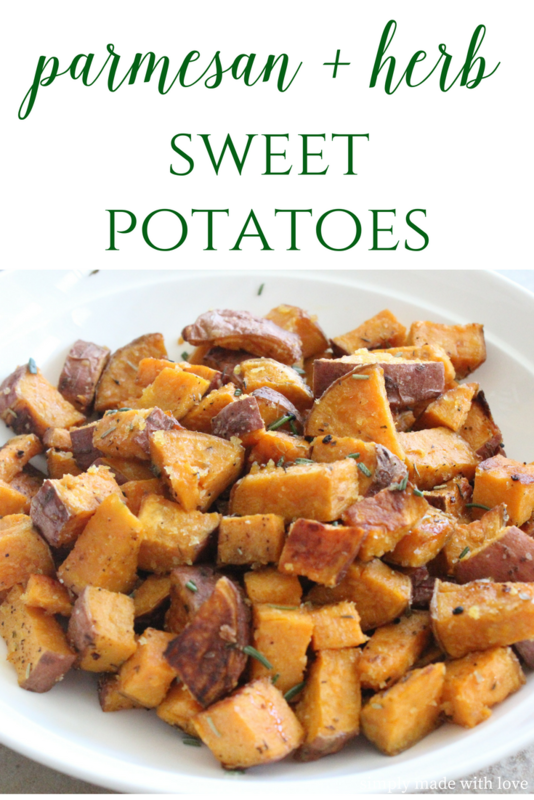 One of my favorite combinations for sweet potatoes is parmesan with herbs. The entire side is pretty simple to make, with ingredients you most likely have at home. On this night, I used the same seasonings on the baked chicken we had with the sweet potatoes. With fall right around the corner, this savory side will be on the menu quite often. Enjoy! 2. Place cubed potatoes into a large bowl. 3. Mix together olive oil and garlic in a small bowl. 4. Pour olive oil mixture over potatoes. Stir to coat. 5. Sprinkle remaining seasoning on top of potatoes (salt, pepper, parsley, rosemary, parmesan cheese) and stir again to coat. 6. Spread evenly onto a lightly greased cookie sheet. 7. Bake for about 30-35 minutes or until potatoes are slightly browned. Stir once about the 15 minute mark.